I have always loved Indian languages. They have such a distinct flavor and yet are so mesmerizing. Urdu has been my first love solely for the beauty though I also love Punjabi, Bengali, Awadhi, Rajasthani, Hindi and Gujarati. Needless to add this love of mine has made me read translated works of many famous regional authors mainly to bask in splendor created by them. 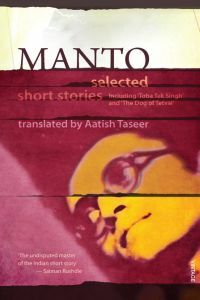 Manto – Selected Short stories translated by Aatish Taseer is a collection of short stories by Saadat Hasan Manto, one of the greatest short story writers as he is often referred to as. He was an epic writer of his times and has left a mark in the world of literature through his impeccable work. Due to which even today, after almost a century of his birth he is known as the most powerful voices of his time. About Saadat Hasan Manto - He has been called the greated short-story writer of the Indian Sub continent. His stories are highly controversial and he was tried for obscenity five times during his career. To read more about him, please click here. About Aatish Taseer - He has worked as a reporter for Time Magazine and has written for the Sunday Times, the Sunday Telegraph, the Financial Times, Prospect, TAR Magazine and Esquire. He is the author of Stranger to History: a Son's Journey through Islamic Lands (2009) and a highly acclaimed translation Manto: Selected Stories (2008). His novel, The Temple-Goers (2010) was shortlisted for the 2010 Costa First Novel Award. A second novel, Noon, is now available published by Picador (UK) and Faber & Faber (USA). His work has been translated into over ten languages. He lives between London and Delhi. To know more click here. The author, Aatish Taseer has given a very touching introduction in the beginning of this book. He has taken you down the memory lane with him where he explains his relationship with Urdu, how he got this book and what lead him to write this translation. His depiction of this wonderful language has actually left me wanting to learn Urdu now. I must say the poignant introduction set the tone for the entire book as story after story Aatish Taseer has managed to bring out the magic created by Manto in Urdu. One of the few rare translated works where the translation is not literal, but more factual which captures the true essence of the story captivating the readers’ imagination. For every Indian born at any time, the partition remains a very bitter memory. I have read a lot of books on it including Train to Pakistan and watched movies too. Even as I am writing this it gives me goose bumps thinking of all those innocent people who underwent that entire trauma at that time. Most of the Saadat Hasan Manto’s stories carry a background of the partition era taking you back in those times as you try to see the world at that time through his eyes. It is touching to see the giddy limits of pain and hurt a fellow human being can cause to other. Ten Rupees – A story about a young prostitute and the way she sees everything around her including her customers and her life. Blouse – A boy’s coming of age is described so well with the innocence, the confusion and the excitement of growing up and becoming a teenager when you don’t know if you are an adult or still a child. Khol Do – A father looking for his daughter at the time of Partition and the circumstances in which he finds her. This story left me speechless and numb for a long time. As I thought there is not much of a difference in the treatment vetted to a woman – then and now, which is something we all should be ashamed of. Khaled Mian - A moving tale of a father who fears losing his new born child. The emotions of a father are so beautifully brought out that it left tears in my eyes. My Name is Radha – It is said lust is the purest form of emotion. For love can always be camouflaged with reasons. This is a touching tale of a young girl Radha as she tries to explore the difference between love and lust. This book is a treat for an Indian fiction and authors’ lover like me as I could connect to each and every character in the story. The emotions, the language, the descriptions are all so vivid you actually feel you are time travelling to that era when all this was happening in real. The language is very lucid and gripping as it holds onto your attention for long. I would recommend this book to people who enjoy reading classics, especially stories with an Indian back drop. 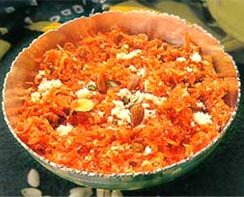 This book is like gajar ka halwa - yummy, mouth watering and immediately makes you feel nostalgic about the good old times! However many times you would have relished it, still there is always one memory associated with it and someone special like our nani or dadi which is cherished in every bite. This book has been received from Random House for review. Oh yes...his stories are truly breath taking... Khol Do one which I have mentioned above had left me speechless. Things still have changed Panchaliji for us women and that is one of the most disturbing fact.